Fact: A black tie was found on the seat cushion 18E the same seat Cooper sat in on the plane . Fact: The tie was a Towncraft #3 clip-on that had not been sold by Penneys (later JC Penney's) for about one year [1,2]. Interpretation: The particles on the tie represent an accumulation based on where Cooper had been and what he was doing for at least a year. In the entire Cooper case, there are only two real pieces of usefull physical evidence currently available: the black tie and the ransom money found on Tena Bar. While the money points to what happened after Cooper jumped, it is only the tie that points to where he came from and the life he led. Of all the possible things for him to leave on the plane, the tie was incredibly fortunate for this investigation. A tie is one of the only articles of clothing that isn't washed on a regular basis. It picks up dirt and grime just like any other piece of clothing, but that accumulation never truly gets 'reset' in the washing machine. Each of those particles comes from something and somewhere and can tell a story if the proper instruments like electron microscopes are used. In 1971, electron microscopes were not in common use and there is no evidence one was used in this case, therefore it is believed that this is the first time this level of investigation has been used to examine the tie. The black tie was found on the cushion of seat 18E, the seat Cooper was sitting in . This fact alone should link the tie to Cooper, but it has been the general position of the FBI that they don't really know if it was Cooper's tie or not. This investigation completed a probablilty analysis based on the most likely scenarios for someone leaving a black tie on a seat in a plane. A probability calculation requires making some reasonable assumptions on the likelihood of events, but in the end, these numbers as calculated here, find that it is reasonable to assume the tie belonged to Cooper. The particles identified on the tie represent the only new physical evidence to come along in the D.B. Cooper case since the money find in 1980. While the age of this case makes it colder, the tools to investigate it have become overwhelmingly more sensitive and sophisticated. This new arsenal of technology gives new heat to cold cases like the Cooper case and makes it well worth investigating even now. All of the particles from the tie shown in this research are too small for the human eye to see directly and are much smaller than even a particle of dust. Generally speaking, the particles from the tie are about one tenth of the diameter of a human hair or about the size of a human blood cell. In order to determine what they are made of, specialized instruments can determine the atomic elements that make up the particles. From there, it is possible to use a database to help determine the closest match that could identify what the particles originally came from. 1. 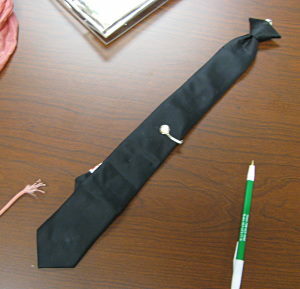 FBI Transcript: "A black clip-on tie which contained a tie clip, yellow gold in color, with a round, white pearl in the center, was located in the seat allegedly used by the hijacker. The tie bore the label "Towncraft", a trade-mark of the JC Penney, Company. Tie and clip were found on seat 18E and Stewardess TINA MUCKLOW, after seeing the tie, said it possibly belonged to the hijacker." 2. FBI Transcript, JC Penney's manager: "He stated that it has been at least a year, and probably a year and a half, since that store handled the narrow type. He advised that these ties are not a dress-type tie but usually worn by working people."